Virus can be defined as non-cellular infectious entities which contain RNA or DNA encased in protein coat and reproduce only in living cell. The word VIRUS is derived from latin word venome means poisonous substance, was used to describe any disease-causing substance. About 50 years before development of the electron microscope, the existence of viruses was demonstrated as a large group of acellular disease-causing agents composed of nucleic acid encapsulated in a protein coat, by L. Pasteur in 1884 and A. Mayer in 1886 during their studies on mosaic disease of tobacco plants. They exhibited that the disease can be transmitted from one host to another under controlled laboratory conditions. However, the nature of viruses was not clearly established by their experiments because neither of these viruses could be grown in pure culture by the methods available at that time. In 1892, D. Iwanowsky prepared an extract from tobacco plants that were suffering from mosaic disease. When the extract was passed through a filterable to prevent the passage of bacteria, the filtrate was able to infect healthy tobacco leaves. As a result of this experiment, these disease-causing agents were named filterable viruses. In 1898 M. Beijernick established that viruses possess the property of replication that is common to all living things. He further established that these disease-causing filterable viruses multiply in the host cells. Later F. Twort and F. d’Herelle independently discovered that some viruses infect bacteria. They termed these viruses bacteriophages, i. e., eaters of bacteria, or simply phages. 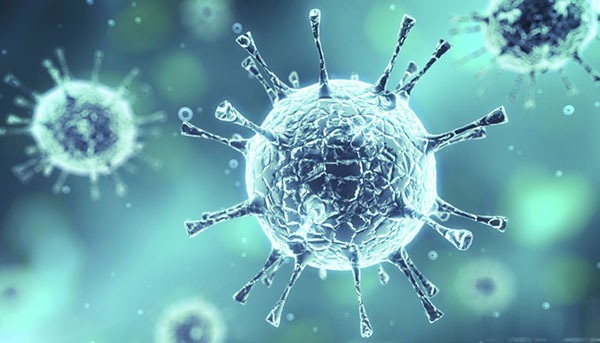 This discovery established the fact that viruses infect and cause diseases in all the three major biological groups, the animals, plants and bacteria. In 1935, W. Stanley demonstrated the structure of plant virus TMV. 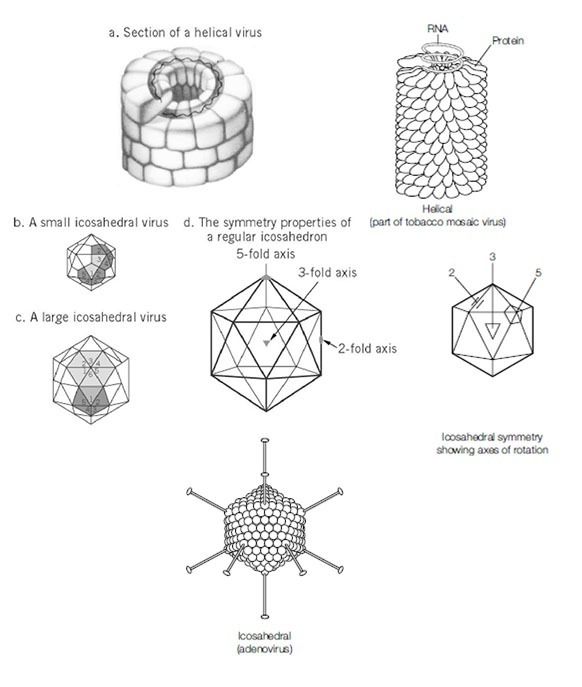 He crystallized the virus and then showed that it is largely composed of protein. Later, other scientists showed that these crystals also contain a small but constant amount of RNA. Chemical studies of other viruses revealed that some contain DNA in addition to protein, but no virus has been found to contain both DNA and RNA. In addition to nucleic acid, some viruses contain lipid, and some contain-small amounts of carbohydrates conjugated to their protein components. The largest and most complex viruses, the poxviruses are composed of nucleic acid and several internal compartments surrounded by membranes. They are disease causing agent. They are quite small, therefore invisible in the light microscope arid to through filters that retain most bacteria. They do not multiply in cultures designed to support growth of bacteria, i, they are non-living outside the host cells. They are composed of nucleic acid DNA or RNA core surrounded and protected by a protein coat called capsid. The DNA or RNA functions as viral genome. Those that contain RNA contain on unusual biological property of having genetic information permanently encoded in RNA. These cause diseases in man and other animals. They usually consist of DNA core protected by capsid. These cause diseases in plants. A plant virus consists of RNA core surrounded by protective protein coat, For example tobacco mosaic virus (TMV). This is a special group of viruses. They have RNA as their genetic material. They cause serious disease such as AIDS in humans. These are plant viruses that contain single-stranded DNA as genetic material. Viruses vary greatly in size and shape. The smallest, simplest and structurally complete infectious viruses are virions. These range in size from 20 to 350 nm. 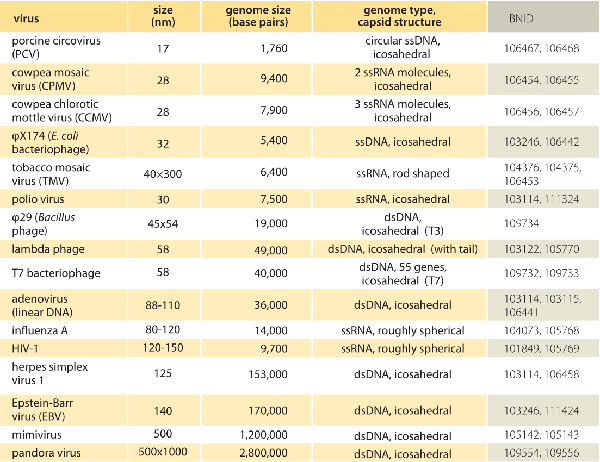 Most viruses range in size between 10 and 300 nanometers. Poliomyelitis, yellow-fever and foot-and-mouth disease-causing viruses are smaller in size with a diameter of about 25 nm, whereas smallpox viruses are larger, about 250 nm in diameter. Since most viruses measure less than 150 nm, therefore, they are visible only under electron microscope. 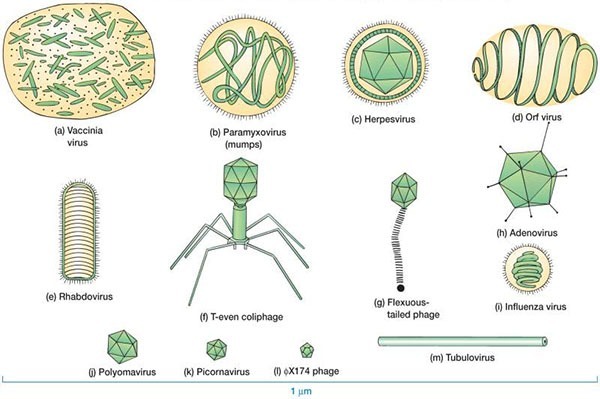 The viruses exhibit a variety of shapes. They may be rod-like, i. e, elongated like a piece of insulated electrical cable (TMV); rounded (mump virus, herpes virus, influenza virus); tadpole-shaped (bacteriophage); or bullet-shaped (rabies virus). Bacteriophages exist in different shapes, but most of them possess a polyhedral head and a tail through which they infect the host cell. Some bacteriophages are filamentous. The viruses are non-cellular and possess a very simple structure. Each virus consists of a DNA or RNA filament forming a core. the fully assembled, infective particle is called a virion. The virus DNA is surrounded by a coat of protein called a capsid This structure formed of nucleic acid and capsid is generally termed as nucleocapsid. The capsid is made up of proteins. These include basic proteins, the histones; histone-like proteins (adenoviruses); or small peptides and polyamines (bacteriophages). Lipids and carbohydrates are also found in viruses. These include phospholipids, glycolipids, neutral fats, fatty acids, and cholesterol. Phospholipid is predominant in viral envelope. The virus coats (capsids) are often built up of identical repeating units called capsomere. The capsomeres form highly symmetrical structures that can be crystallized help to study their structure through X-ray crystallography and electron microscopy. Most animal viruses such as herpes and influenza viruses, have an additional lipoprotein envelope derived from the surface membrane of the host cell. However, all the plant viruses and phages are naked. The viral genome consists of nucleic acids. Bacteriophages and animal viruses contain DNA where s plant viruses contain RNA usually. Both DNA and RNA never exist in the same virion. Virions that contain only a single copy of the nucleic acid are called haploid. However, retroviruses contain two identical RNA single strands. So, they are termed diploid.